Preschoolers may do a lot of singing and finger painting, but teaching them takes more than fun and games. For most children, preschool is their vital first experience of structured learning and play… preschool teachers plan the lessons and create the environment that makes it all possible. Preschool teachers educate and care for children ages 2-4. They present reading, writing, science, and other subjects in ways their young students can understand. Preschool teachers organize activities and routines to balance playtime, rest, and physical activity throughout the day. They teach the basics of language, numbers, shapes and colors, as well as social skills. They also monitor children’s progress to share with parents, and flag any concerns for early intervention. 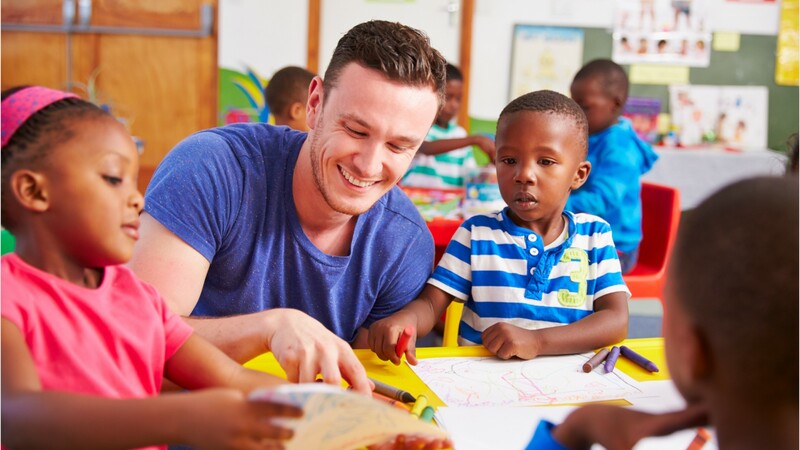 Preschool teachers work in childcare centers, non-profit centers, and public and private schools. In public schools, preschool teachers generally work during school hours, and may have summers off or teach summer programs. In day care settings, hours may be longer and schedules are typically year-round. Education and training requirements range from a high school diploma and certification to a college degree. Childcare centers generally require a high school diploma and a certification. Head Start and other government programs may require a 2- or 4-year degree. Public school preschool teachers need a bachelor’s degree in early childhood education or a related field, and an early childhood education license. See more details at O*NET OnLine about preschool teachers. Preschool Teachers by U.S. Department of Labor, Employment and Training Administration is licensed under a Creative Commons Attribution 4.0 International License.